Tracey's message for today... "Today, focus on love. Feel it. Be it. Capture it. Share it." I spent the entire day thinking up the perfect shots to create. I struggled and tried a couple of different ideas. I searched my house for hearts in our holiday decorations. I set up some posed shots. Nothing worked for me. I finally sat myself down... determined to think of the perfect photo to represent love. 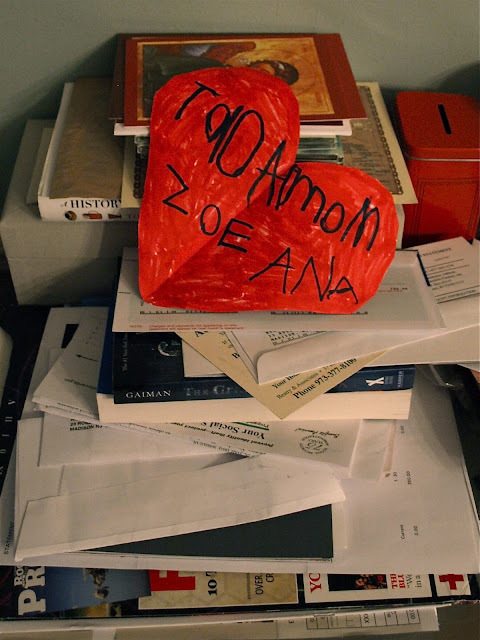 Sitting in the dining room I found a heart made by Zoe with the words she's known how to spell the longest: TO DAD MOM ZOE ANA. Gathered bills, statements, magazines, books. Just clutter. No set up. No perfect poses. A little bit of love in a pile of chaos.